This issue sees events come to a head as the enigma of the nightmares is finally resolved and we discover that Doctor Psycho has been behind them all! Simultaneously we are introduced to a mysterious group of renegade Amazons as things begin to climax towards the major “War of the Gods” crossover event. At times this is a difficult plot to follow as it jumps around all over the place! As both Diana’s and Hermes’ minds are toyed with, they see false visions of each other and hear words that are not truly spoken by each other, causing them to confront one another on the mistaken assumption that the other is out of control. The dialogue on occasions can be quite confusing as the reader tries to ascertain when it is Diana’s and Hermes’ real words and when it is Psycho’s. At the Adams School in Boston Massachusetts the school week comes to an end and Vanessa asks if Eileen needs to catch a lift home with her and Julia. Eileen replies that her dad always picks her up on Fridays and Vanessa suggests that her friend perhaps comes over later so they can get their homework out of the way before the weekend. Eileen agrees and smiling, the friends bid goodbye to each other as Vanessa is driven away by Julia. Meanwhile their departure is watched by the heavily pregnant school counselor Helen Anderson through her office window. Just then Horace Westlake enters and asks if he can have a word. She offers him a seat and asks him what she can do for him, although she already has a suspicion what he has come to see her about. He says that he wants to talk about Vanessa. Horace asks what sort of miracle man Helen has discovered as far as the girl’s Psychologist is concerned. Helen replies that he assumes the teacher is referring to Vanessa’s mid term results. He nods and continues that he has never seen such an incredible turnaround. This psychologist must be some sort of motivational genius. Just last month Vanessa was distraught, withdrawn and practically dysfunctional but now it is a different story! Horace asks Helen where she had found the psychologist and she replies that she and Dr. Charles Stanton had gone to school together. Looking at the results she admits that while she knew Charles was good at his job, she never realised he was quite this good. She then says that Horace is the fourth of Vanessa’s teachers to see her today, including Julia. Vanessa’s mother had been thrilled and said it was not every day her daughter came home with straight “A’s”. Helen then says that Vanessa has never ever got straight “A’s” and to be honest, the results she has been getting look almost like those of an entirely different student. Horace raises his eyebrows and asks if she thinks Vanessa has been cheating? Helen shakes her head and says she is not sure. Part of her is delighted that Vanessa has recovered from her recent traumas but another part of her feels there is something not quite right about all of this. Horace replies that he believes Dr. Stanton should be thanked for what he has done and pondering his suggestion, Helen responds that perhaps he is right. “..and the sooner the better”. A few hours later as darkness falls Wonder Woman glides effortlessly though the Boston night sky. She feels Hermes beckon her and can feel his presence grow stronger. Meanwhile the God sits on top of a spire not far away and becomes aware of her as she approaches, musing that no mortal woman has ever stirred his heart and mind quite the way Diana does. 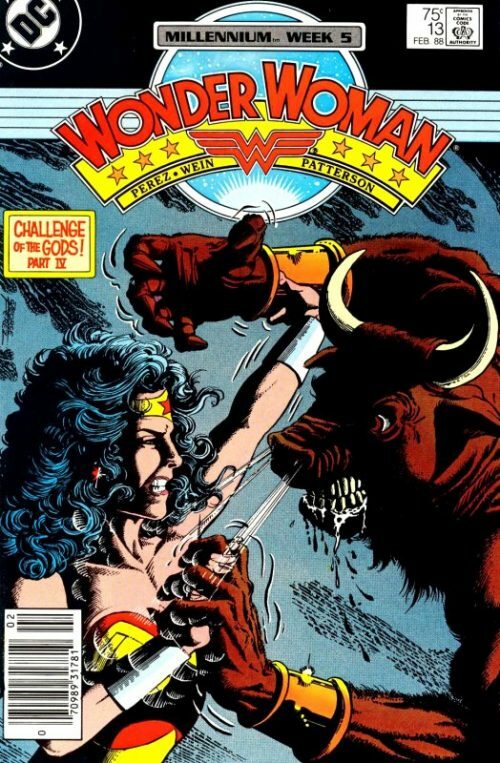 As Wonder Woman sees him sitting there she hopes that his summoning implies that his ill will towards her has ebbed. Perhaps then some of the accursed nightmares she has been experiencing these past nights will finally cease. For his part, Hermes hopes that his response to Diana’s call will put an end to his own sleepless nights. She sees him rise up and holding aloft his Caduceus, he greets her, saying that at last she has answered his call. “You are in time to bear witness to the re-balance of the cosmic scales. Tonight a God is reborn!” he bellows. 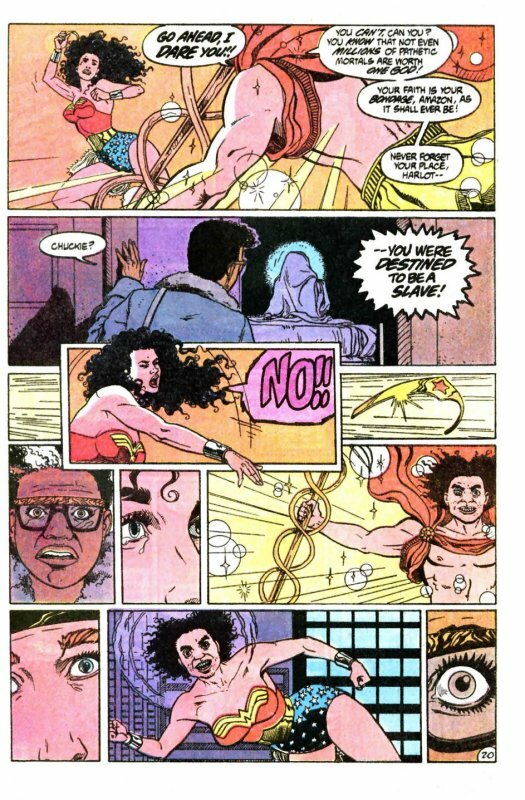 Wonder Woman asks if he is alright but he tells her not to interrupt and not to be afraid. He is indeed the Hermes she has ever loved and trusted and who for so many recent days has been the cause of her distress. But no longer will he be an embarrassment to those who worship him. She tries to interject but Hermes snaps back, ordering her not to speak. He then snorts that his recent battle with the Roman God Mercury has shown him the path to redemption. Mercury had sort to strip him of his power by consuming Hermes’ temple. But that is not where the God’s greatest reserve of energy lies. “It is here” he says, gesturing to Boston’s cityscape below them. His power, his essence…his very Godhood course through the veins of the city and it is his right as an Olympian to reclaim what is his! 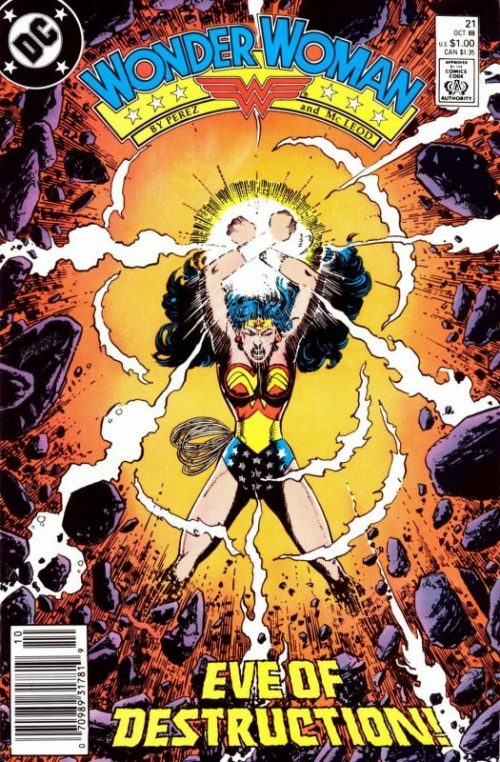 A stunned Wonder Woman hears the God say “For Hermes to live…Boston must die!”. 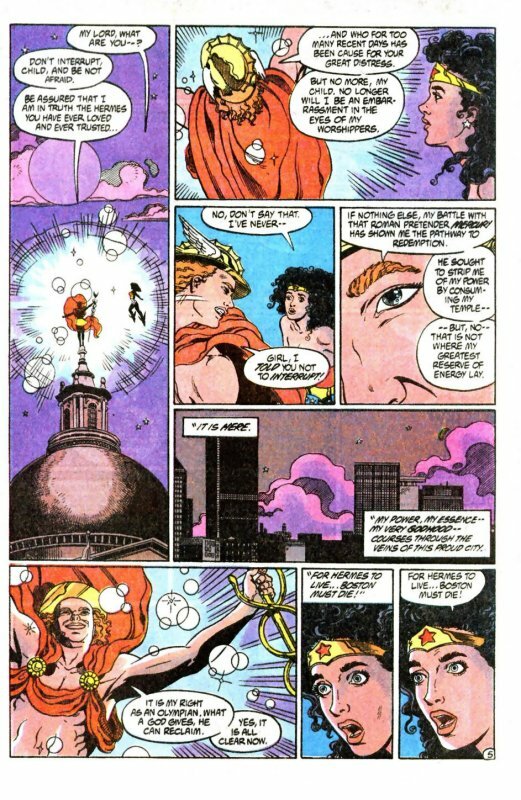 From his perspective though, Hermes has been listening to the Amazon speak and is equally shocked to hear her suggest that he levels the city! Meanwhile at the Museum of African American History, Lt Karen, Lt. Dellrosa Marshall and Lt. Mike Shands are on a stake out. Shands tells his skeptical colleagues that he had not asked them to join him as it was simply a hunch he had. Karen replies that they figured he would need some sort of support, especially since Inspector Indelicato obviously did not buy Shands’ theory that the Amazons are involved with the recent museum crimes. Elsewhere on a traffic congested freeway on the outskirts of Boston, Helen Anderson sits in her car wondering what she is even doing here. Dr. Stanton may not even be at home. She should be at home with her husband and the children, she thinks to herself. She then muses how she should at least be happy how things have turned out. Lucy Spears is dead but at least she had managed to save Vanessa. She then chastises herself for thinking she had anything to do with it. Dr. Stanton is the miracle worker here. He always did have that special touch. Something about his voice and those beautiful blue eyes. Too bad he was not so accomplished when it came to his own relationships though she sighs. In a hotel in Gotham city meanwhile, Phillipus remarks to Hippolyta how foreboding the city is. The Queen replies that it is like any other and that Phillipus is just letting her years as captain of the Amazon Guard skew her perceptions. Phillipus shrugs her shoulders and says that Hippolyta may be right but she cannot help feeling that perhaps they are unwise not to have brought some weapons. The Amazon Queen tells her captain that she had often considered it herself before coming here, but that would have broken faith with all that their pilgrimage represents. As she carries the Themysciran cup and places it on the mantle piece, she adds that the people of this world gave them the Goblet of Heracles as a token of atonement and confidence. They must now be worthy of that trust. Phillipus says that she is right of course but the magnitude of it all overwhelms her. They have already had three international tours cancelled due to various conflicts around the globe. This world cannot even share its own natural resources without declaring war! 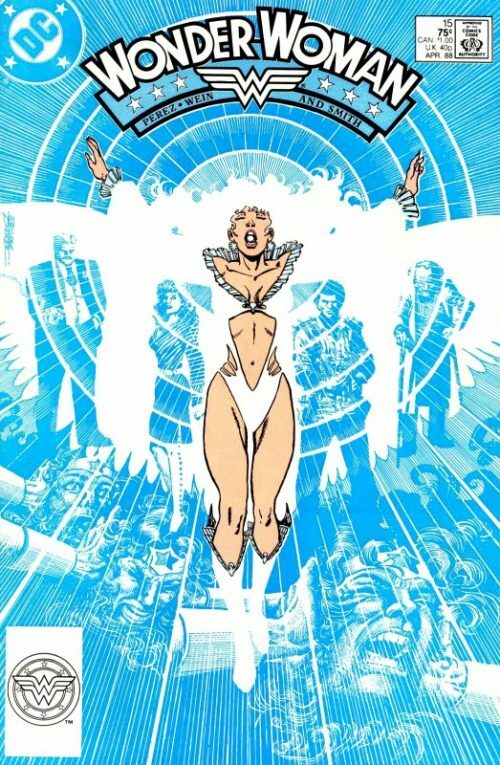 Hippolyta responds that Patriarch’s World is not some outland beyond their shores – it is the Amazons’ world too now – or so destiny has decreed. It is therefore their duty to aid in its healing. More than just messengers of faith, they are also messengers of hope. Back above Boston, A confused Hermes is wondering why Wonder Woman is telling him he should destroy Boston to prove himself. He hears her say how she will no longer let him embarrass his worshippers and how she is tired of saving his “sorry egotistical hide!”. If he wishes her allegiance she demands that he earns the right! Furious he rages at her impudence bit she responds that he should save his threats for someone who fears them. “You are in time to bear witness to the re-balance of the cosmic scales. Tonight a god shall be reborn!” she cries. He tells her that what she asks for will result in the death of her adopted home, but what Wonder Woman hears him say is that it is a home that “mocks her faith”. As each hears the other decree how they will lay waste to Boston, they race forward to stop one another. 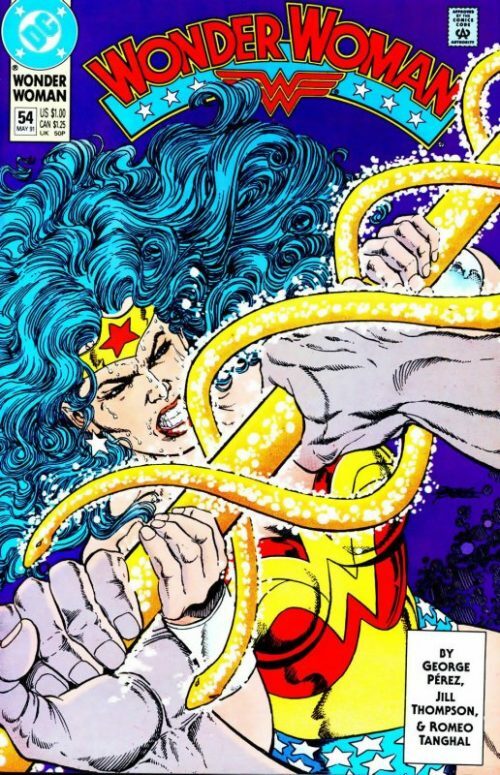 Hermes uses his Caduceus to blast Wonder Woman as she advances on him with her lasso unfurled! Elsewhere at the Museum of African American History, Lt. Karen and Lt. Dellrosa use torches to check the darkened corridors of the building. Becoming increasingly frustrated at the futility of the stakeout they suddenly hear the sound of gunfire and a scream from Shands. Rushing in the direction of the commotion they train their lights on two Amazon warriors clutching a bloodstained axe and sword. At their feet lies a blood covered Shands! Meanwhile in Gotham, Pythia and Hellene are outside Hippolyta’s hotel room having heard some sort of disturbance inside. Phillipus and Euboea join them and the Amazon Captain suggests they give the Queen a knock on her door. As Hellene steps forward to do so she notices that the door is ajar. Phillipus hears the sound of safety catches being released and hurls herself at the floor, taking Hellene with her as a hail of gunfire bursts forth from inside the room! A group of masked men rush out clutching the Goblet of Heracles and the robbery is picked up on nearby surveillance cameras. The security guards immediately call for back up and grab their own weapons. As the first one rushes out of the room though he is cut down by an axe! At the hotel security lodge in Gotham, three Amazon warriors mock how puny the men of this world are. Suddenly one of them sees the images on the monitor screen showing the masked robbers spraying the corridors with machine gun fire as they make good their escape. Two of the gunmen order the rest to exit via the emergency stair well while they “take care of the babes!”. Seeing they have taken the Goblet of Heracles, the Amazons watching the screen realise they have to stop the men and call in reinforcements. Down in the lobby police arrive and tell the bemused manager that they are responding to an alert given by his security staff. Before they can even advance up the stairs though another group of Amazons wearing disguises unleash a hail of daggers! Upstairs the remaining two gunmen cease firing, assuming they have dissuaded Phillipus and the other Amazons to give chase and turn to make their escape. But they are tripped and felled by the Amazon Captain and Pythia who have snuck around via another corridor and taken them by surprise – armed with coat stands! Pythia picks up one of the dropped machine guns and stares at it, in awe of its frightening firepower. It is unlike anything the Amazons have ever seen on Paradise Island, save for Phillipus that is. As Euboea and Hellene join them they inform the Amazon Captain that there is no sign of Hippolyta anywhere. Phillipus takes the weapon from Pythia and announces that she is going after the other robbers. Euboea says that she cannot go after them alone but Phillipus replies that she is the only one here familiar with these “flashing thunder machines”. She then instructs the three Amazons to keep searching for the Queen. Phillipus races down the fire exit as Hellene reaches down and picks up the other weapon. Euboea and Pythia ask her what she is doing and Hellene replies that she had prayed Diana would be right about Man’s World. But nothing has changed. It is still a never ending war between Man and Amazon! Helen slowly climbs the staircase wondering where Charles is. As she reaches the first floor she hears a voice bellow from one of the bedrooms “Finish it, damn you!”. Helen gingerly opens the door and sees a small figure sitting on the edge of the bed with his back to her and head covered with a sheet. She calls out, assuming it is Charles but the man who turns to look at her is not Dr. Stanton! 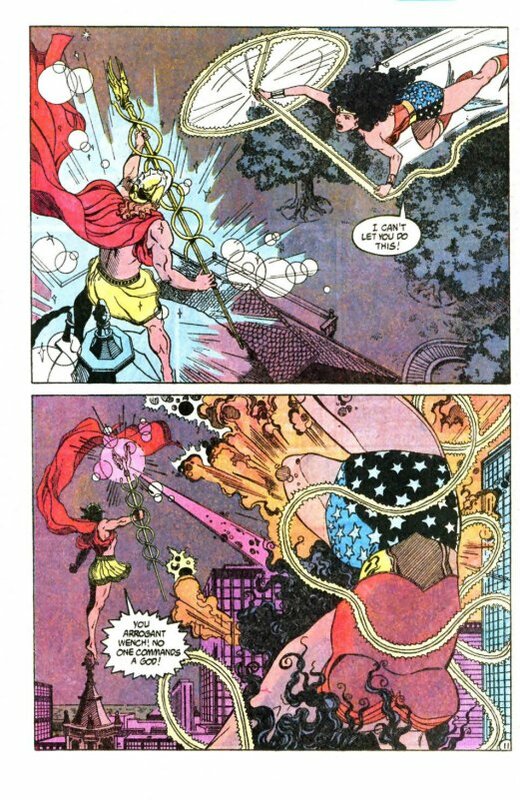 For that brief moment the dwarf’s concentration is broken and in the skies above Boston, Wonder Woman sees the face of the ugly stranger instead of Hermes’ face, while the God also sees his face instead of Diana’s. Helen’s world goes black as she collapses to the floor in shock. The dwarf stands over her, fuming that after all his planning and months of preparation it had almost come to nothing because of her. She had almost destroyed his greatest masterpiece and she will pay for that! When he is finished she will be begging for mercy- just like Stanton had. The Psychologist had wanted to get inside his mind and the dwarf had let him. The mighty Wonder Woman and even Hermes – a God no less – had all succumbed to his powers…the powers of Dr. Psycho!